I'm back from Year 3 of the New York Comic Con. It was a really fun and exhausting show. I think I only got up and wandered for a total of 2 hours the whole 3 day con. 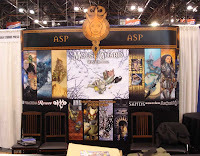 It was great to see ASP with such a large space (last year's San Diego was like being in a sardine can). And I am proud to be published by a company that boasts the creative works of A.Dave Lewis, Sean Wang, Jon Rea, MATZ, Mark Smylie, Nick Tapalansky, Alex Shiekman, Jeremy Bastian, Alex Eckman-Lawn, Grant Bond, and many many more. When I arrived in NYC on Thursday I was whisked off to Burning Wheel Headquarters where Luke Crane had me playtest the Mouse Guard role playing game. To save some time, we used sample characters and got right into an adventure. I could go on and describe the system, the situation, or the details, but instead I'll sum it up with the most important part: I had a lot of fun playing it. Thanks Luke and Thor for the dinner and adventure! James Gurney has been on my list of great illustrators for some time. I discovered his work in an issue of Smithsonian magazine where he discussed his process. There were photos of his dinosaur models and gadgets and goggles he had modeled as reference for authenticity in Dinotopia. James and I have e-mailed back and forth a few times recently and I was really excited to meet him face to face. If you haven't check out his blog, it's AMAZING (and if you have checked out his blog, you know it's amazing). He posts on composition, color theory, painting techniques, model making, history, and concept thinking. It's like a refresher for all the things you wish had been explained better in a college art curriculum. It was also fun to catch up with Runner artist/writer Sean Wang and his lovely wife Peggy. I met Sean a few years ago and read his first self-published collection of Runners on the plane ride home. I have been hooked ever since. Runners is the continuing adventures of alien smugglers, rouges, and outcasts in a sci-fi setting that brings the best parts of Star Wars, without ever crossing the line of being derivative. 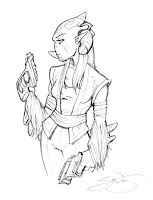 My favorite of Sean's characters from the book is Grissom, a smuggler from our heroes' past. Sean did this awesome sketch for me while in NY this weekend. Thanks Sean! A new Runners series will be coming this summer through Archaia Studios Press. May 3rd is Free Comic Book Day. I'll be at Green Brain comics in Dearborn, MI (unsure of the time yet, but I'll aim to be there by 10AM.) 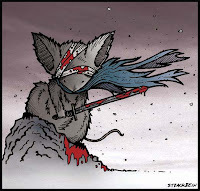 I'll be giving out a Free Mouse Guard print especially made for Free Comic Book Day. (I'm sorry to say that the print will not be available though sources other than Green Brain...sorry out-of-town fans, I'll try and get something out there in a national way next year) So stop by and chat and pick up some free books! This Wintery piece comes from the hand of Matt Strackbein. Thanks Matt! 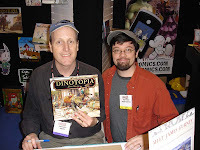 2008 Eisner Award Nominations Announced!!! And Mouse Guard received two nominations!! 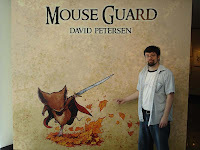 Best Publication for Kids Mouse Guard: Fall 1152 and Mouse Guard: Winter 1152, by David Petersen Best Graphic Album (reprint) Mouse Guard: Fall 1152, by David Petersen. I am thrilled and excited to have my book nominated for this award. It's a dream coming true. The Comics discussion group at the Eastwood Schulers in Lansing, MI was wonderful! I had a great time. The store holds a monthly comic discussion group (which I think is amazing that a bookstore is forward-thinking enough to hold). I was also pleased by how polite and thankful the attendees were. I received more 'thank you' emails the day after from that crowd than I have from any other event. So a big THANK YOU back to the attendees and to the organizer at Schulers, Whitney for being such a wonderful host. Comic Geek Speak is having a convention of their own this fall. After the success of their 200th and 300th show parties, the decided to make it an annual event (instead of based on the number of shows in the can). They asked me to do the cover for the program. I was pleased to have the mice marching with the CGS banner and ringing the Liberty bell all the way to the show in Philly. My three nieces are helping a family in-need in their area. To do this they are collecting bottles, taking donations, and selling their artwork. Well I loved that they wanted to help (they are all under the age of 10!!) 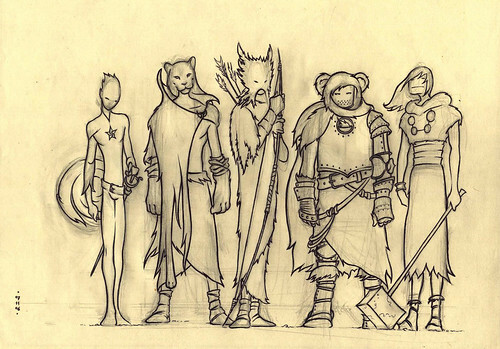 so I commissioned them to do a piece of Mouse Guard fan art for the cash donation. 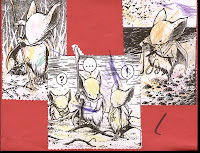 Emma and Kate each drew mice (and were relieved that I wanted to see their style of drawing and not try to copy what I do) Lauren, the youngest, declared that what Emma and Kate were doing was "too hard" so they printed off some images from last years sketchbook for her to color. Thanks for being such wonderful little girls that you offer your time and service to help the less fortunate!! Last week before seeing my dad off safely for his surgery, I headed out to my old woodland stomping grounds to gather some photo reference. 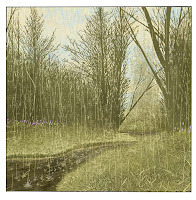 Not too far from my childhood home were some nice wooded areas with streams and some wildlife. As a kid I played back there a great deal and even built a fort back there (which had a working fireplace!!) On Saturday mornings (in most any weather) friends and I would head up to our fort and cook frozen burritos, pasties, and one time even scrambled eggs. We would pass the day following the stream, climbing trees, gathering firewood and repairing/improving the fort (it wasn't 100% water-proof). So last week, while tromping around there, I was able to see the location that once was our fort, but the high stream wasn't something I was up to try to cross all for a photograph of the wood pile that was a part of my childhood. However, the photos I took did contribute to this springtime image. Last Saturday I had a wonderful time at the Flint Institute of the Arts doing a lecture presentation on Mouse Guard, my background and my process. The lecture was well received by the audience. I think they enjoyed seeing how I start working from a rough script and then were able to see the steps through a final colored and lettered page. After the lecture I took questions from the audience, and there were some really good ones! 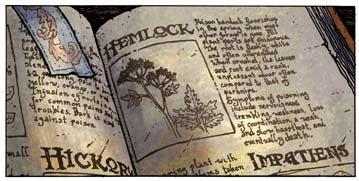 Questions about why I use animals to tell the stories, why I use the format I do, and lettering. 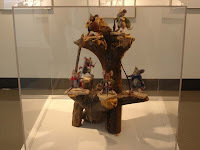 The lecture was followed up by a trip to the gallery where they are showing 20+ pages of inked Mouse Guard pages from my collection (the pages and covers I don't/won't sell) I also brought up the Mouse Guard sculptures I did back in '03. Friday night when I was bringing them up from the studio for transport, I dropped two of them and broke them. So at midnight I was mixing up epoxy and trying to make sure all the sculptures would make an appearance. 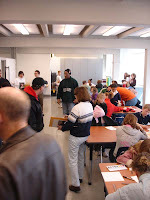 As this was part of FIA's educational workshops, they opened the studios for young and old to draw and paint. I wasn't able to get around to many of the artists working away, but it was wonderful to see the studio packed with parents and kids dreaming of world and characters far far away from the chilly day in Flint. The final leg of the FIA day was a signing outside of the gift shop. 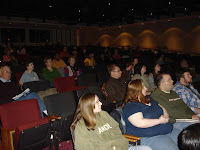 It was a very nice turnout and great to see so many Flint-area fans. 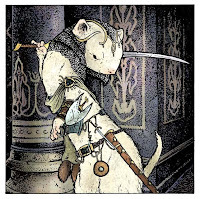 Because the characters in Mouse Guard are based on friends of mine, many of the people in line hadn't read Mouse Guard, but knew or were related to the pals of mine used as the basis for Kenzie or Lieam. Monday April 7th I'll be attending the Eastwood Schuller's bookstore in Lansing for their monthly comic discussion group (7:30 PM). I'll be taking questions and signing and perhaps sketching if time permits. If you are in the area please stop by and say hello! 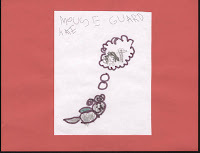 Megan Cutting is a HUGE fan of Mouse Guard and attended the FIA event last Saturday. I have met Megan and her parents a few times now (she has been to every Flint event I have done so far). At the library reading in Jan. she had the cast sign her Lieam plushie. 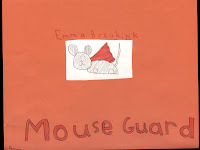 This time she gifted me with a piece of fan-art of her own Mouse Guard character "Burnheart" Thanks for the drawing and loyal fan-ship Megan!